Creamy sharp cheddar cheese sauce with a rich smoky flavor adheres perfectly to tender semolina elbows. The perfect side along with southern barbecue foods & coleslaw! 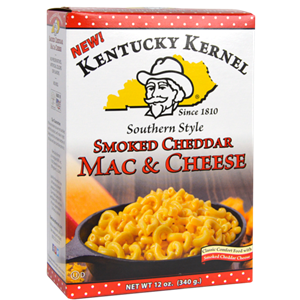 Just as good straight from the stove top, or wow everyone with the Kernel’s version of baked macaroni. The irresistible smoked cheddar flavor is distinct, but tasty and versatile enough to reach for again and again. You’ll just need to add butter and milk!